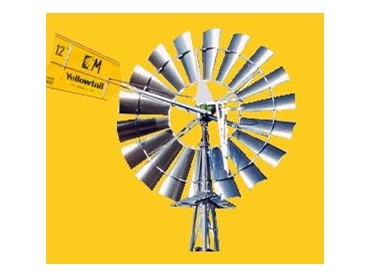 Windmill Supplies , leading supplier of water pumping equipment and windmills for the rural community, introduces the Yellowtail Windmills. Originally known as the Metters "M" windmill, the Yellowtail Windmills were developed in the late 1950s from the older "K" and "Nu-Oil" models that Metters had manufactured since the early twentieth century. Now in production for more than 40 years, the Yellowtail feature wheel arms, or spokes, built as a one single piece "A" frame to make assembly easier, and to give a more rigid structure to the Windwheels. The sails on the Windwheels are built around the outer ring to ensure they will not work loose. All Yellowtail Windmills now have steel platforms, plus the entire Windwheels are bolted together under tension creating a tight, solid structure that will withstand gale force winds. StormProof : automatically protects the Windmils' tower in high winds. Safety ladder: a turntable inspection ladder is fitted to the 10-14ft models that rotates 360º with the Windmill. Twin Pinions: carbide gear teeth will ensure long-life, and pinions will not loosen or allow the large gears to work out of alignment. Rugged Windwheels: the Yellowtail features a tension Windwheel that turns in the lightest breeze, yet is rugged enough to withstand gale force winds. Long Life Replaceable Bearings: the main casting of the gearbox is line bored and fitted with long-lasting replaceable bearings. "A" Frame Wheel arms: strong one piece "A" frame wheel arms are easier to assemble, hold more securely to the hub and hold the Windwheel section rigidly in place. Built in Sails: the galvanised steel sails are laced into the tension Windwheel and are spaced, shaped and curved for maximum pumping efficiency over a wide range of wind speeds. Double geared: with in-built speed control and manual shut-off. Self maintenance: automatic lubrication for all moving parts ensures long life and low maintenance. Do you make 7ft pumping garden windmills? 30/04/2013 - Sorry, we don’t have this product at the moment.